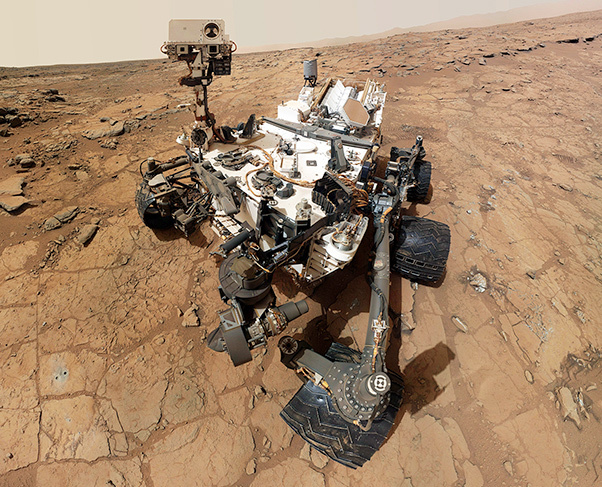 Aerojet Rocketdyne’s MMRTG will power NASA’s Mars 2020 rover, similar to the pictured Mars Curiosity rover which has been on the red planet since 2012. Aerojet Rocketdyne, in collaboration with Teledyne, recently delivered the electrical power generator for NASA’s Mars 2020 rover to the U.S. Department of Energy’s Idaho National Laboratory, where it will be fueled, tested and readied for flight. In addition to providing the primary power source for the rover, Aerojet Rocketdyne is also playing a critical role in spacecraft propulsion for the journey to Mars. The Multi-Mission Radioisotope Thermoelectric Generator will supply electrical power to the rover as it traverses the red planet, collecting samples for a potential return to Earth by a future mission. A similar device supplied by Aerojet Rocketdyne continues to power the Mars Curiosity rover, which has been exploring the Martian surface since 2012. The MMRTG is just one of Aerojet Rocketdyne’s contributions to Mars 2020, key elements of which are now coming together at NASA’s Jet Propulsion Laboratory in Pasadena, Calif. A number of Aerojet Rocketdyne thrusters will help keep the spacecraft on course for Mars following launch, and maintain stability and control as it enters the Martian atmosphere.